I want to store many records in a MySQL database. All of them contains money values. But I don't know how many digits will be inserted for each one. Which data type do I have to use for this purpose? VARCHAR or INT (or other numeric data types)? These types are used when it is important to preserve exact precision, for example with monetary data. I prefer to use BIGINT, and store the values in by multiply with 100, so that it will become integer. For e.g., to represent a currency value of 93.49, the value shall be stored as 9349, while displaying the value we can divide by 100 and display. This will occupy less storage space. Mostly we don't perform currency * currency multiplication, in case if we are doing it then divide the result with 100 and store, so that it returns to proper precision. 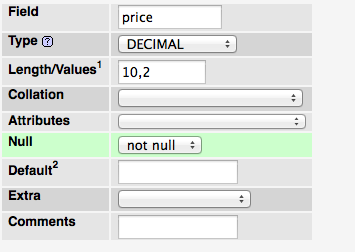 Using DECIMAL(10,2) usually is enough but if you need a little bit more precise values you can set DECIMAL(10,4). If you work with big values replace 10 with 19. Usually you should sum your money values at 13,4 before rounding of the output to 13,2. Indeed this relies on the programmer's preferences. I personally use: numeric(15,4) to conform to the Generally Accepted Accounting Principles (GAAP). At the time this question was asked nobody thought about Bitcoin price. In the case of BTC, it is probably insufficient to use DECIMAL(15,2). If the Bitcoin will rise to $100,000 or more, we will need at least DECIMAL(18,9) to support cryptocurrencies in our apps. DECIMAL(18,9) takes 12 bytes of space in MySQL (4 bytes per 9 digits). Because it can represent any 15 digit number with no constraints on where the decimal point is. All for a measly 8 bytes! This is useful because we're dealing with global currencies, and double can store the various numbers of decimal places we'll likely encounter. If you try doing the same with decimal, you need decimal(30, 15) which costs 14 bytes. Of course, using double isn't without caveats. Writing it back to the database. Another kind of caveat is, unlike decimal(m, d) where the database will prevent programs from inserting a number with more than m digits, no such validations exists with double. A program could insert a user inputted value of 20 digits and it'll end up being silently recorded as an inaccurate amount. Not the answer you're looking for? Browse other questions tagged mysql sqldatatypes currency or ask your own question. How to handle and/or store money values in web applications? What is the best data type for money in mysql? how can I stop mysql from rounding float values?